IFA President, Joe Healy said that farming can be a dangerous occupation, and that is why it is so important that farmers take a proactive approach to farm safety. IFA National Farm Safety Awareness Day (July 21st) is about encouraging farm families to take time to review their Farm Safety Risk Assessment document to make their farms a safer place to work and live. 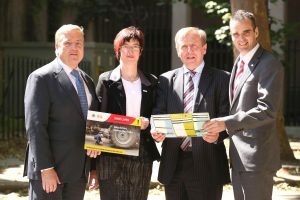 Launching IFA National Farm Safety Awareness Day July 21st (l-r) Pat Breen, Minister of State at the Department of Enterprise; Maura Canning, IFA Farm Family Chairperson; Michael Creed, Minister for Agriculture; and, IFA President Joe Healy. On Farm Safety Awareness Day, farm families are encouraged to take time to consider farm safety and to review their Farm Safety Risk Assessment. An IFA Farm Safety Risk Assessment Planner is included with each copy of the Farmers Journal this week. “By taking the opportunity today (Thursday), IFA National Farm Safety Awareness Day, to review safety on your farm, by identifying, managing and putting in place preventative measures, the risk of accident or ill health is reduced for you and your family”, said Mr. Healy. He said that staying safe is not just about protecting your health but the productivity of your farm business. IFA has produced an easy-to-use Farm Safety Risk Assessment Planner, which the IFA President encouraged all farm families to use to review safety on their farms. “Each injury or illness means people can’t work, whether it’s for an hour, a day, or permanently. This impacts on the productivity of the farm, and on your ability to enjoy the lifestyle offered by farming”, said Mr. Healy. IFA Farm Family and Social Affairs Chairperson, Maura Canning recognised that a lot of farm families are under enormous financial pressure at the moment, which is taking a toll on their physical and mental health. “It is so important that, despite the pressures that many are experiencing, safety remains a top priority”, said Mrs. Canning. “It’s important that farmers think about risks before doing tasks, it doesn’t have to be complicated; by making simple and practical changes you can significantly reduce the risk”. Mr Healy said that getting all the family involved in updating the Farm Safety Risk Assessment Planner is a good way for everyone to take responsibility for managing safety on the farm and being aware of the potential dangers. IFA National Farm Safety Awareness Day is part of the IFA’s ongoing SAVE LIVES, Think Safety, Farm Safely campaign to raise awareness of the dangers of working on a farm and to encourage farmers to change working practices to reduce risks.